Swarojgar Laghubitta Bikas Bank Limited (SLBBL) registered under the Company Act 2063 as a Microfinance Development Bank located in Banepa Municipality of Kavrepalanchowk district, Nepal. SLBBL was established in 2009 A.D. ( 2066 B.S.) 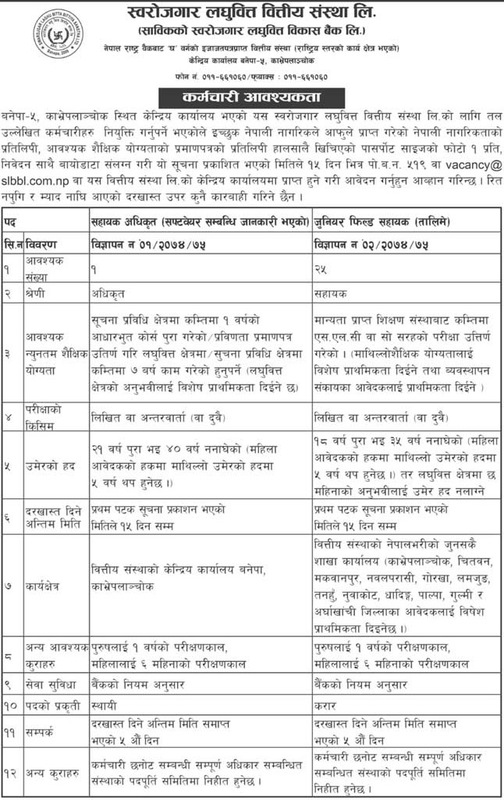 and Permitted to operate service as a class "D" Bank by Nepal Rastra Bank ( Central Bank of Nepal). The main objective of the establishment of the bank is uplifting socio-economic status of the poor and backward communities by providing Micro-Finance services to female group members on group-approach basis.